DUKE RILEY’S 2,000 strong pigeon army streaks through the Brooklyn night sky – scoring tons of positive press, from all sources, big & small. there’s a huge profile on the Duke in the MAY 2016 – WALL STREET JOURNAL MAGAZINE. it comes shortly after the pages on the big LARRY GAGOSIAN profile, with its mention of Larry now repping (along with CANADA, and good-bye Gavin) . . the newest & youngest mega art star in the NYC-based constellation, JOE BRADLEY. 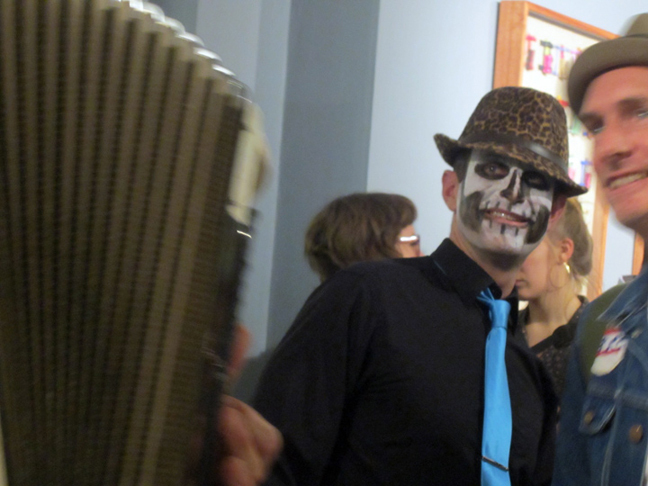 a word: tell me NYC – isn’t the center of the art world ? haha. a word: URS FISCHER, now showing with both Gavin and Gagosian makes a telling quote in the same article . . .
a word: this is just what it was like to live through the rapid rise & big $$ days of Jean-Michel Basquiat and Keith Haring back in the late 1980s – early 90s. it was quite a rush, and nobody else mattered. 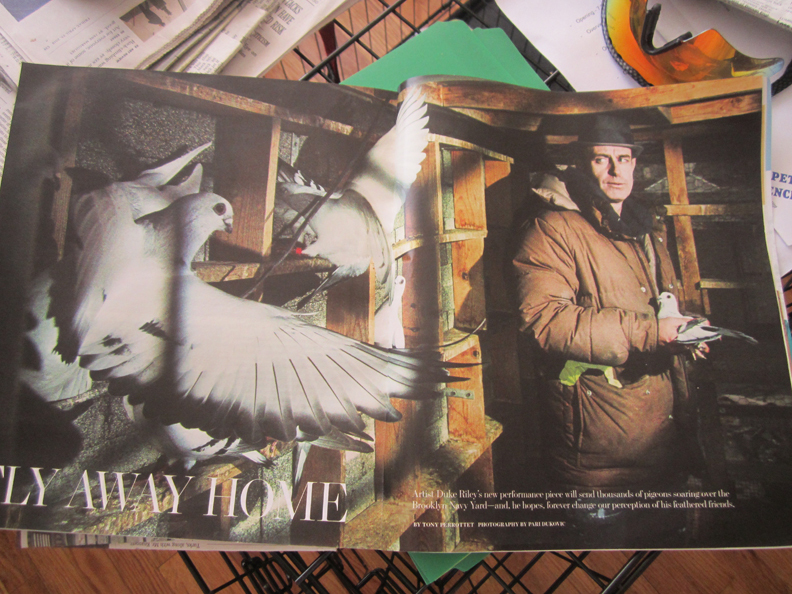 see: ‘FLY AWAY HOME’ with DUKE RILEY’S PIGEONS’, WALL STREET JOURNAL MAGAZINE, MAY 2016. I’ve probably got the best, most extensive, and most definite !! the earliest treasure trove of DUKE RILEY PHOTOGRAPHS. here’s a few from the artlovers’ archive . 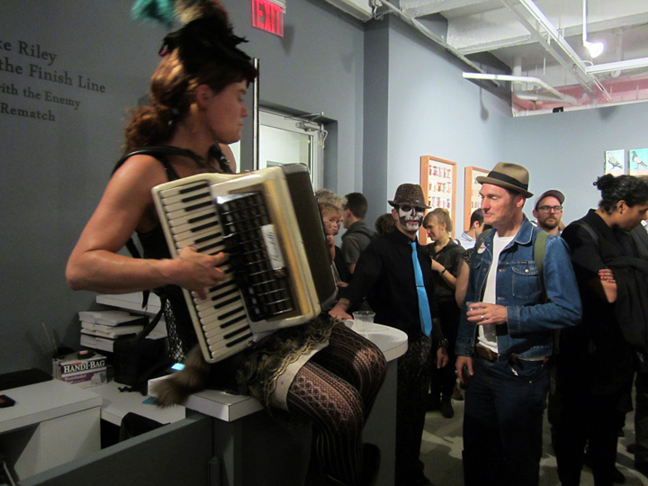 . .
MAGNAN METZ GALERY, 521 W. 26th St, Chelsea, NYC. it’s the opening night of his first major show to center solely on his pigeons, in which he sent them to smuggle cigars out of Cuba. equipped with little digital cameras to record their flight, from a birds-eye-view, (footage was screened in the show), each bird had a tiny backpack strapped on to their back – in which to carry the contraband. I spy DUKE RILEY, Duke RILEY spies me. MARY GO ROUND entrances with sad sea-worthy ditties. DUKE RILEY . . at the opening of ‘See You at the Finish Line’, NYC. 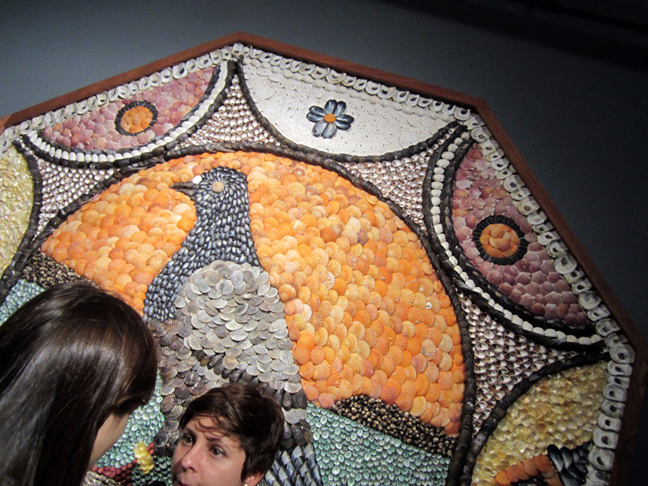 NOV 1, 2013.
a glimpse of one the large, pigeon-themed murals in the show. unlike his previous shows, these murals were not made of mosaic tiles, but were composed entirely of sea shells. yep, guess one day, I’ll have to do . . a book. please note: these photos are COPYRIGHT PROTECTED – any use without prior written permission from NANCY SMITH/artloversnewyork . . is STRICTLY PROHIBITED. and ask anybody. name names ? Guest of a Guest, Business Insider, artinfo (case pending) . . I don’t joke around.